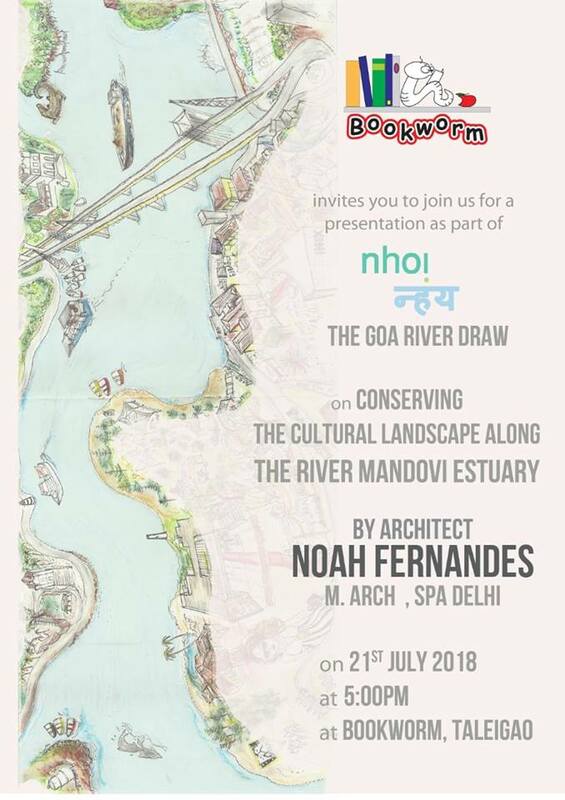 Last Saturday July 21, 2018 at Bookworm library was time for special close up look at Mandovi River. One who guided was a professional Architect Noah Fernandes from School of Planing and Architecture, Delhi. 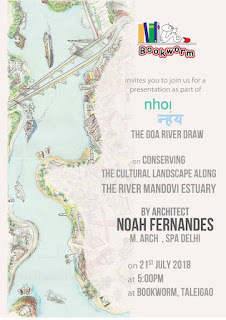 Aided by slides Noah journeyed through geography, history, sociology, economics and ecology of mandovi river banks and mouth. It was indeed fascinating to attend to his presentation and further participate in a discussion in a flow. Few points that figured for discussions must not be rested in the lecture room of the hosts who organized but must be given privileged position in wider public domain. With this intend we record few points of public importance that came up from this lecture and subsequent discussions. 1. Pr-Portuguese Goa had Goa's Mandovi river bank managed by Communidades. Panchayats were absent. Communidades are village organizations involved in maintaining reclaimed khazan lands used for fishing and agriculture. Few community groups that found their way in Noah's presentation includes Brahmins, Chardos, Sudras and Gaudes. One who is missing are Mahars and Chamars. What could be the reason for this miss? Were they not existing? Or were they invisible to historians? Or historians shared prejudice against them as untouchables? Were they really out of village borders and consequently out of border of history? How did mharingan (od Mahars) and mand (of Gaudas) existed side-by-side on Mandovi river banks now under Syntenta captivity leased by Santa Monica? 2. This system continued during Portuguese rule beginning from 1510. Goa's Pr-Portuguese community organization remained in tact till 1961 when India replaced Portugal rule Goa. After this community organization of communidades suffered as they were sidelined by Panchayat system of administration. Mandovi banks specially its reclaimed lands faced hasty set back. 3. Portuguese founded their capital at the banks of Mandovi at Old Goa. After the plague Old Goa city population around two lakh people were moved to Panjim in 1843. One Researcher Manuel Texeira from Portugal has observed that population of Old Goa was as big as Population of London. 4. Casinos are polluting Mandovi river. Due to high level of political pressure studies on casino pollution are neither attempted nor published. Academia has accepted political throttling. 5. Mining barges are polluting Mandovi river. Barges are operating by investing loaned money from banks in Goa. Public money are used by barges for polluting Goa's rivers. Its time these banks are listed and exposed. The data is available at Captain of Ports, Panjim. Every loaded barge is dragging river bed and aborts fish life. Several basket full of fish dies and birds eat in the middle of the river. 6. Nationalization of rivers is a threat to Mandovi. This is due to Sagarmala project that aims to construct several Jetties along the coast. Sagarmala project is meant to create investment opportunities for the bankers including European banks that are running out of opportunities in Europe due to high level of public awareness and public oppositions to infringe and inflict ecological aggression. 7. Water sports is creating serious problems to fishermen due to release of oil from their engines. Oil is released also from Casino boats as well as mining barges. In Zuari water sports is being carried on from Hotel Grand Hyatt despite opposition. Avertano Furtado, former fisheries minister of Goa is reported by fishermen saying his hands are tied and water sports is being carried on in Zuari due to orders from Central Government in Delhi. 8. Purse seine boats are creating serious ecological hazards as tiny fish life is caught by them creating depletion of fish in Zuari river. Disruptions are caused also by trawlers in Zuari. Both are illegal and both are existing. Public attention is needed here. 9. Islands in Mandovi are formed due to sedimentation process. However it needs to be pondered as to whether sedimentation process also deposited minerals in the islands as islands are rich in minerals and Chorao island also has mining lease that is canceled. It may be possible that other factors such as earthquakes may also be responsible island formations in Mandovi. Needs further examination. 9. Banks of Mandovi had ingenious workers that maintained embankments by using soil. This practice discontinues and on Islands like Divar soil is replaced concrete funded by agriculture department without CRZ permissions. Actually it looks like a road in order to open up island for construction by escaping CRZ laws. 10. Divar coast is also affected by project of Subakar Rao related to water sports and tourism by cutting down of mangroves. 11. Vanxim island paddy fields are sold by Goa Archbishop without consulting the villagers and it is huge fraud. 12. Maps that Noah used are highly informative. We now know Candolim village was known as Khandull during Pr-Portuguese days. Noah has opened up some deeper questions for deeper investigation and deeper remedies. We remain thankful to Noah as well as Bookworm library. Interdisciplinary collaboration is needed for Mandovi river and other rivers in Goa too.